Isn’t it interesting how just about every reviewer here at MR, who took on Korpiklaani review of late, longingly wished how “insert the name of your album here” would be more like Tales Along this Road or Tervaskanto, yet it didn’t match those earlier masterpieces? Yet, throughout these reviews the writers always found things/songs to like on whatever album it was they were reviewing, so that just about every album by the Finns in the end had redeeming qualities. You can check the links, I have re-read them. Confess, if yours truly took on reviewing those same albums, I probably would have had searched for the early glory as well, and I even probably did so on my review of Korven Kunningas. The truth is I somehow felt that Korpiklaani was a little tired on Ukon Wacka and Manala. Perhaps it is their tempo of album releases, or maybe it is their relentless and extensive touring (I saw them twice here in the US in the last 5 years). So I was actually glad that they took three years (long by their standards) between the last album and Noita. Whether I was alone in detecting fatigue with the Finns or not, but the band definitely needed a “retool and recharge” album. And I am happy to report hereby that in an opinion of this fan Noita succeeded in this goal. Keeping it simple and heartfelt was always a ticket for Korpiklaani’s success, and Noita does exactly that, doing best job combining Finnish folk and metal as in earlier days. 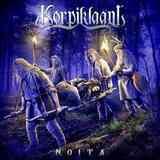 I don’t want to write an analytical treatise reviewing Korpiklaani’s album, but Noita worked for me on many fronts. There is the return of the not overproduced, slightly archaic sound. Keyboard accordion was replaced with the push type, something considered more folk and authentic (we have the same thing in Ukraine calling this instrument bayan). Korpiklaani also learned to use their violin player Tuomas Rounakari better. The guy is a genius, I saw him shred live, and his solos are now given prominent role throughout, basically elevating the instrument to a status of a lead guitar at times (Kylästä keväinen kehto, Ämmänhauta). When the two “non-traditional” instruments, for metal anyway, jam together (Sen verran minäkin noita, Viinamäen mies) the things range from crazy (Sen verran minäkin noita) to earnest (Viinamäen mies). But most importantly the songs on Noita are just that more catchy than the songs on a pair of its immediate predecessors. The combination of humppa rhythms, power chords, folk melodies and Jonne Jarvela scratchy voice hit bullseye on Viinamäen mies and Sahti. A little research using trusted Google Translate also shows that those are familiar drinking songs by Korpiklaani, judging by the titles, The Vineyard Man and Home-Brewed Beer, respectively. Songs like Viinamäen mies, Sahti, Pilli on pajusta tehty and Luontoni, played on a sunny day on a morning drive to work will lift your spirits and boost your confidence. It is so much fun to yell out those short stories atop of the lungs, not having a foggiest idea what it is you are actually saying. Songs like these made me remember the moshpits Korpiklaani always managed to get going at the shows I attended. The brotherhood of drunken men, indeed, willing to throw away all worries just dancing breakneck. There are a pair of slower stretchy wistful numbers on Noita. Lempo and slightly cleaner Minä näin vedessä neidon may get a little tedious at times, but connected to the album subject matter (Noita means witch), I feel those songs are incredibly important to Korpiklaani themselves. I felt it seeing live how Jonne Jarvela was almost in a trance state singing and swaying with his eyes closed to Vesilahden Verajilla. Then there is a heavy gallop of Jouni Jouni, with accordion riding atop the heavy colt, the rocking Kylästä keväinen kehto with a killer chorus, and the least Korpiklaani sounding, almost sinister death metal in spots, Sen verran minäkin noita, where dementia demonstrates its onset and spirits take over at the end. So, you can say Korpiklaani experimented on Noita, and did that successfully too. Their lineup now revamped with a new accordion player Sami Perttula, the band will no doubt go on tour soon. And just like years ago, I will try to catch them there, happy and somewhat relieved the Finns are not yet ready to fade into oblivion.